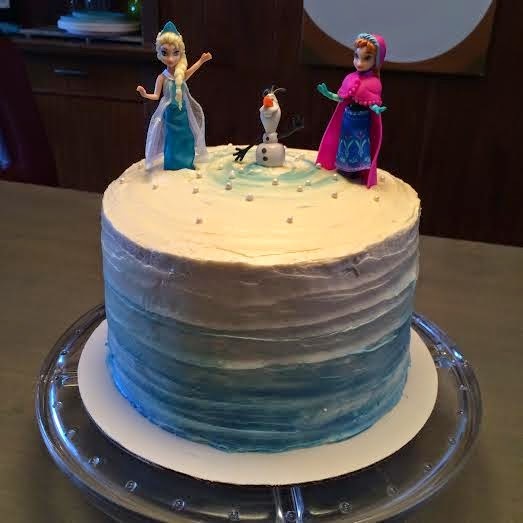 Making The Most of Naptime : FROZEN 3rd Birthday Cake! Last week was my daughter's 3rd birthday. 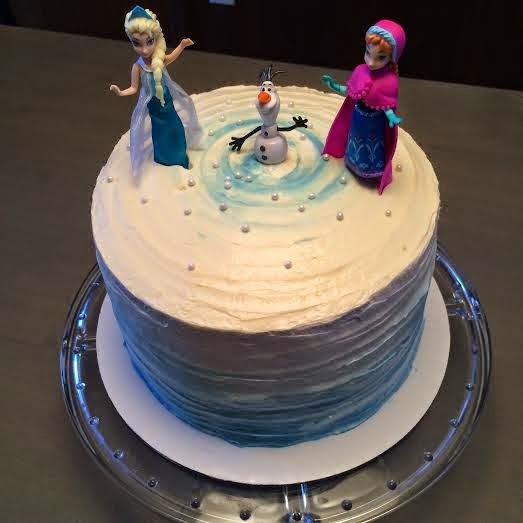 In about November, she informed me that she NEEDED to have a frozen cake with "lotsa lotsa lotsa blue layers." I was lucky enough to find some cute little frozen figurines on Amazon, which made this cake a very easy one. The most time consuming part was baking the actual cake and making the icing, not decorating. 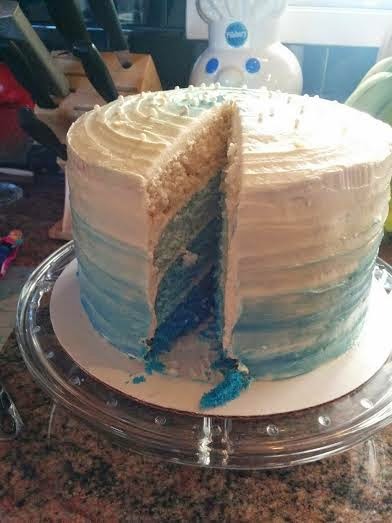 Since she wanted "lotsa blue layers", I needed to make a white cake. Scratch white cake and I aren't exactly friends. I find it really hard to make a white cake that isn't either super dense, or just weird tasting. I'm usually pretty faithful to boxed white mix. I can't say the same for chocolate cake (where it seems a scratch cake is always better). This time I vowed I would make the cake from scratch. Somehow I lucked out, because after trolling Pinterest for a recipe that looked different from all of those I've already tried, I think I found a keeper. It's from Sweetapolita. I didn't change a single thing about the recipe, and it was just the right density, stayed moist for 3 days, and even endured being frozen for a couple days before decorating! Check out the recipe here. As she suggests, make sure you measure carefully, and USE CAKE FLOUR. It truly does produce better results! For the decorating, I used Martha's swiss meringue buttercream. It's less sweet than traditional buttercream, but honestly, I think I could have used an icing sugar variety. The Sweetapolita cake recipe contains a buttercream recipe with it, and I would like to try it next time. The cake has that perfect level of sweetness that I think a super-sweet icing wouldn't have overpowered it. Next time I suppose. I crumb coated the cake and then iced it with plain white icing. Then I tinted a few tablespoons of icing blue, added some to the bottom of the cake, and swirled it gradually up the cake while turning my cake turntable. I did the same with the top of the cake by starting with a small gob of blue in the middle and swirling outward. It made it look like Olaf was standing in the middle of a little snowstorm. My daughter was thrilled (and so was I), with the results of such a simple technique.